This web page outlines what I know about Ann Marie "Polly" Bollinger and her daughter Eliza Smith. Unless I note otherwise, this all takes place in North Carolina. Our story starts over 200 years ago when, on 28 Feb 1761, Christian Bollinger was born to Jacob Hans Bollinger and Anna Maria Bauman. Jacob Hans Bollinger was born in Switzerland. Anna Maria Bauman was born in York County, PA. Some records show Christian was also born in Switzerland but some show he was born in PA. There are web sites that trace this family back a couple more generations. "Christian Bollinger came from Switzerland and settled in PA. Was an early pioneer of what is now Catawba County. He went west on a hunting trip with nine other men: only one returned. He reported that Christian Bollinger with the others had been killed and scalped by Indians. The widow of Christian and her children came from PA, by wagon train, about 1800. She settled in what is now Catawba Co."
"Those settling in the Catawba Valley were originally of two distinct communities: Those speaking German and those speaking English. The Palatine Germans and Swiss generally found land to their liking in the northern portion of the county which resembled the ridges and rolling hills of their homeland. For the most part, the Scot-Irish and English settlers formed the communities in the south-east part of the county." Soon after arriving in what is now Catawba County (it was all Lincoln Co then), Margaret married Jacob Seabaugh (Seabach/Sebach). They had at least one more child, Margaret born 12 Dec 1801. Jacob Seabaugh died 22 Dec 1809 in Lincoln Co, NC making Margaret a widow for the second time. From "Lincoln Co NC Will Abstracts 1779-1910" FHL 975.6782 p28m : #1095 "Jacob Sebach, will dated Nov 1804, probate Jan 1810. wife Margaret. Her children and wife's children by her first husband: Jacob Sebach, Peter Sebach, Lionder Bollinger, Christian Bollinger, Susanna Bollinger, Anna Mary Bollinger. My youngest children John Sebach and Margaret Sebach. My other children: Catharina Sebach, Joseph Sebach, Georg Sebach, Magdalena Sebach, and Elizabeth Sebach. EXEC. Peter Hoyl, Henry Roth. WIT: Abraham Smith, Christian Sebach". 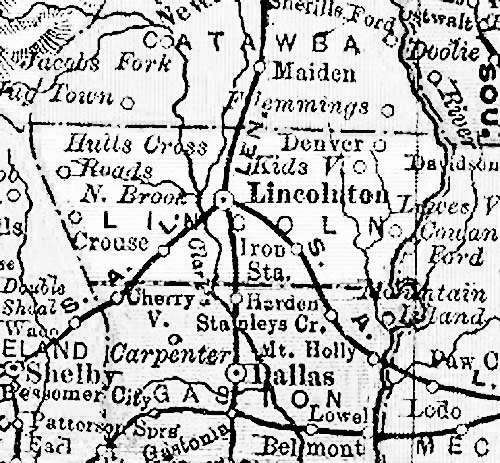 Note about Lincoln Co : Lincoln Co was formed in 1779 out of Tryon Co which was abolished. Rutherford Co was simultaneously formed out of Tryon. 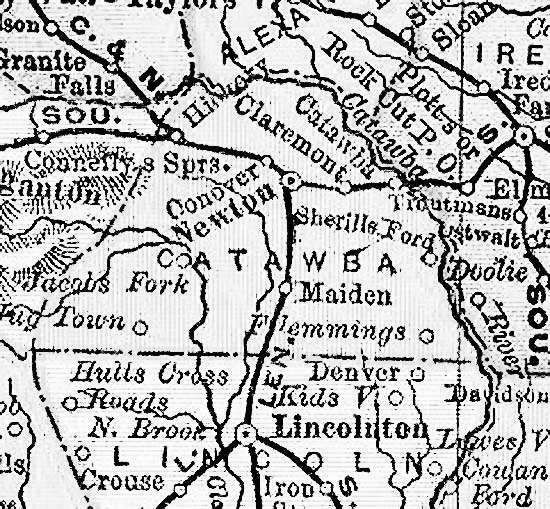 In 1782, the part of Burke Co roughly corresponding to present-day Catawba Co was added to Lincoln. Christian to Sally Reynolds on 9 Jan 1837 in, Lincoln, NC. Legion to Catherine Killian on 24 Dec 1808 in, Catawba, NC. Legion died about 1858 and is recorded in will book 1-139 in Catawba Co. I can't find a marriage for Anna Susannah or Anna Marie. Church records at Daniel's German Reformed Church lists church members for 1833. Both a Polly Bollinger and a Mary Bollinger are listed as members. In 1842, Catawba County was formed from the northern part of Lincoln County. In 1846, Gaston County was formed from the southern part of Lincoln County. From "Lincoln Co NC Will Abstracts 1779-1910" FHL 975.6782 p28m : #1096 "Margaret Sebach, will dated 25 Jul 1843, probate March 1848. Daughter Mary. To Eliza Mahaly Smith. EXEC. son Legion Bullinger. WIT. Henry Rhodes, Calab Miller. Book 2 pg 295". By 16 Sep 1850, Anna Marie, who we now learn was called Polly, age 59 years, was living with Eliza Smith, age 17 years. From the 1850 census, we also learn that Eliza was born in NC. They were still living in Lincoln County. Sometime in the 1850's, Polly and Eliza moved from Lincoln County to Hickory Tavern, Catawba County. They moved in next door to Polly's nephew Michael Bollinger and his family. Michael was a farmer. I believe Polly lived next door to Michael until at least 1880. In Sep 1859, Eliza had her first daughter, Alice (a later census told us that she was Mary Alice). By 28 Jul 1860, Polly (in the census as Mary), Eliza and Alice were living in Hickory Tavern, Catawba County. Mary/Polly was 68 years old, Eliza was 27 years old and Alice was 1 year old. Eliza was a weaver. They lived next door to Michael Bollinger and wife Catherine. Michael was Polly's nephew. They also lived next door to Wesley and Margaret Miller and their family. Wesley and Margaret had 3 children including 1 year old George W. who would, in 1877, marry Alice Smith. In February 1861, Eliza had her second daughter, Laura (later we learned she was Laura Ann). By 20 Jul 1870, Polly, 73y, was still living with Eliza, 33y, in Hickory Tavern and there were now two children, Alice, 10 years, and Laura, 8 years. For the first time, we learn that neither Polly nor Eliza could write, although both could read. They lived next door to Polly's nephew, Michael Bollinger, and his second wife Minerva. About 1871, Eliza had her third daughter, Lon or Lori. Throughout all these years, we never learned of a husband of Eliza. From the time she was 17 years old, her surname was Smith. Alice married M. M. Bollinger on 6 Jan 1877 in Catawba County. Both were 18 years old. M.M. must have died within a short time of their marriage because by the 1880 census, Alice was remarried, to George Miller (her neighbor in the 1860 census), and had a 1 year old daughter. Laura A. Smith married Felix Baker on 7 Feb 1878 in Newton, Catawba County. Felix was listed as "Fielden N. Baker". Laura was 19 years old and Felix was 23 years old. Felix was from Lincoln County. Witnesses were E.M. Bollinger and Robert (or Robt) Baker. To read more about Fielden and his parents, look at the web page for Nathan and Susan Baker. Both Alice and Laura were married by H. (Hyman) A. Forney, Justice of the Peace in Newton, Catawba County. By the 1880 census, Laura, 20 years old, and husband Felix Baker were living in Hickory, Catawba County. Living with them is their son, Harvey O., 1 year old, mother-in-law, Eliza Smith, 47 years old, Polly Bollinger, 88 years old and sister-in-law, Lon/Lori, 9 years old. We learn in this census that Polly was never married and Eliza Smith was widowed/divorced (although, again, we have never seen a Mr. Smith). This census confirms that Polly and her parents were born in PA. They still lived next door to Polly's nephew, Michael Bollinger, and his wife Minerva. Polly Bollinger, who adopted Eliza Smith, died about 1882 at the age of 90 years. "Miss Polly Bollinger, the daughter of Christian Bollinger, lived in Catawba Co. She raised Lir Smith. She was living with the family of George Miller at the time of her death in 1880. She was about the age of 90 years and was buried at Fairgrove [United Methodist] Church in Catawba Co."
When Tony first sent this historical note to me I didn't have a clue what it meant. Since then we have realized that the transcription as sent to me originally read "raised Lir Smith". Most likely, in the original document, the "r" is really a "z" handwritten in the older style where the tail of the "z" does not go below the line and thus looks like an "r". So this Liz Smith was our Eliza! And who was George Miller? In the 1880 census, we see George Miller, age 21y, and wife "M.A." Miller, 21y - Mary Alice Smith - living in Newton Townhsip, Catawba Co. Alice is, of course, Eliza's oldest daughter. With them is their daughter "E.J. ", age 1y - this was Emma, born Feb 1879. We learned from later information that his full name was George Wesley Miller but sometimes written as George Washington Miller. So George was her son-in-law. We also learned that Alice went on to have 10 children. We also saw Emma again in the 1900 census in Reedville, Washington Co, Oregon. Fairgrove United Methodist Church Cemetery is located on Fairgrove Road between highway 64-70 and I-40 exit 128, east of Hickory. Reference source: Catawba Co Cemeteries, FHL 975.6785 v3C v.3 pg 12. Sometime between the 1880 census, when Polly Bollinger was living with Felix and Laura Baker and when she died, Polly (and most likely her adopted daughter, Eliza Smith) went to live with George and Alice Miller. To see as much of a detailed time-line from 1880 onward, look at the web page for George and Alice Miller. 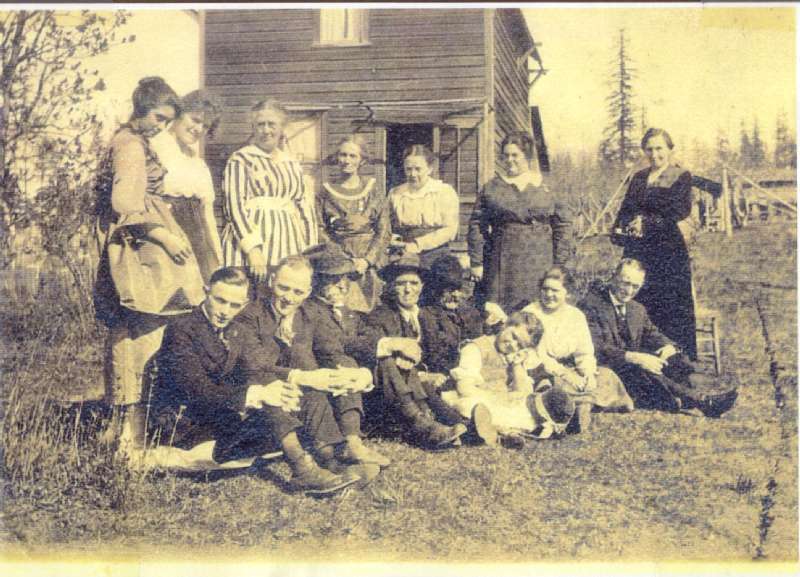 About 1889, George and Alice Miller, along with their 4 children moved to Reedville, Washington Co, OR. Eliza's third child, Lon/Lori, died sometime before 1900 (that census indicates that Eliza had 3 children, 2 of whom are still living - Alice and Laura). From "The Centennial History of Oregon", she died at age 21 which would be about 1892. About 1892, Eliza Smith moved to Reedville, Washington Co, OR to join her daughter Alice Smith Miller and her son-in-law who had moved there some years earlier. By the 12 June 1900 census, we find Laura Smith Baker, 39 years old (born Feb 1861) in Gastonia Township, Gaston County, NC. She is shown as Head of Household and is with her five children: Robert, 18y (born Nov 1881), Lestor, 13y (born July 1886), Lela, 10y (born April 1890), Charlie, 6y (born Aug 1893 - Charles Baker is Bette's father) and Cornelius, 2y (born Nov 1897). Felix is gone. We don't know what happened to him. He must have been around to conceive Cornelius as late as 1896 (although Bette Baker Clarno spoke of rumors that Cornelius had a different father). Laura had been married for 22 years and is still shown as married (even though Felix is not listed). She had five children and all five are living (although she really had 8 children by then). In Reedville, Washington County, OR, the 27 Jun 1900 census shows Eliza Smith, 67y born Dec 1832, living with daughter Mary Alice and son-in-law George Miller. George and Alice had 9 children, 8 of whom are still living. George and Alice's daughter Emma (who we saw in the 1880 census) was married to George W. Taylor and they had one child, Bertie, 1y old. 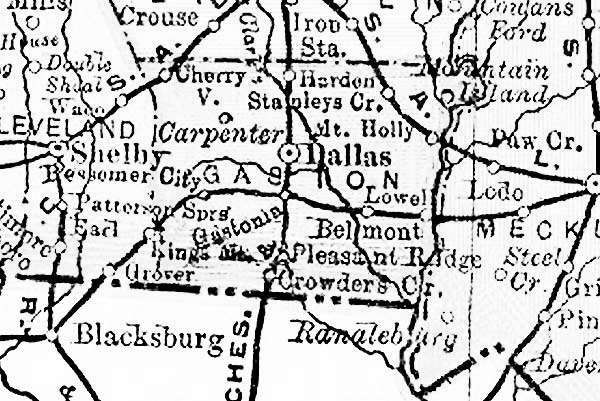 By 25 April 1910, Laura (49y) is still in Gastonia Township, Gaston County, NC. Living at 17 South Park Ave with sons Thomas (19y or 17y), Charlie (15y) and Cornelius (11y). Laura is shown as widowed but married 32y and she had 8 children. In Oregon, the 27 Apr 1910 census shows George and Alice still in Reedville, OR. They had had a 10th child by then. Eliza Smith does not appear in this census. Eliza would have been about 77y. I've gone through the Reedville census (26 pages) line by line but did not find Eliza. Also, I can't find her in North Carolina. "I have figured from marriage and death dates that Laura and at least Charles, my father, and Cornelius, the two youngest of the family, moved to Oregon in 1912. Possibly Robert, too." "Elizabeth M Miller is living with them, enumerator states her as being the mother, but she`s actually the mother-in-law and says she was born in NC and her parents born in Pennsylvania". Kieth had found George Miller's parents and the mother was not this woman. In 1900, Eliza was 67y, so now twenty years later, she is 87y. The census indicates she was born in NC and her parents were born in PA (as we know that Polly Bollinger was - even though Polly was her adoptive mother and we don't know anything about her father). "I have a copy of a wonderful picture that Cornelius's daughter, Ruthann, sent to me a couple of years ago. 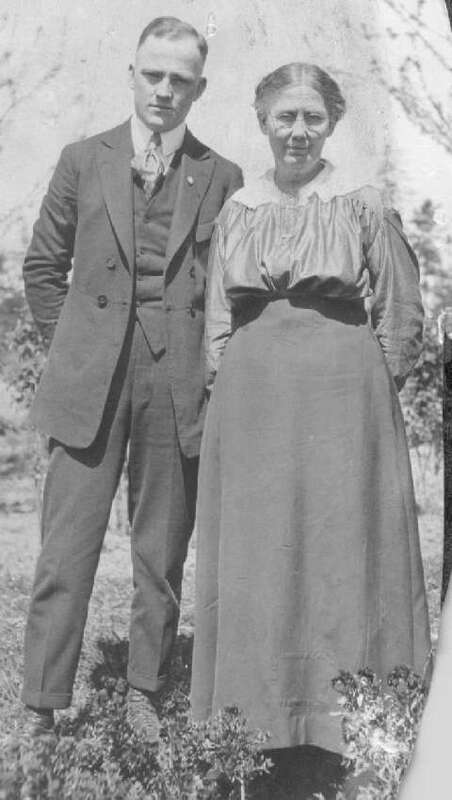 It shows Cornelius and his new wife, Fay, on their wedding day in 1919. Also in the picture are my father, Charles Lee Baker and my mother, Frances Amelia Martin. They married four months later. Besides them are my grandmother, Laura Baker, and some other men and women, and a man who was definitely a Baker in looks. Could it have been Robert? It was taken in Beaverton, OR which is a suburb of Portland." 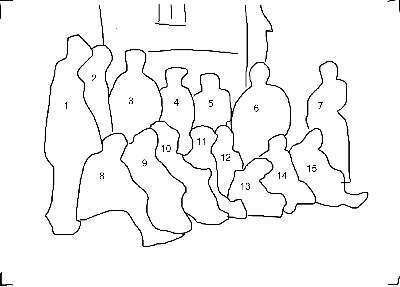 Note that it appears that the husband of each woman is sitting on the ground in front of his wife. It seems like whoever setup this photo, had put people in very specific spots. #1 Fay Etta Curtright (18y), wife of (#8) Cornelius Baker "Fayetta, my mother"
#2 Frances Martin (Bette Baker's mother), wife of (#9) Charles Baker "Betty's mother"
#3 Laura Smith Baker Young (57y), wife of (#10) Thomas Young (and previously, Fielden or Felix Baker) "Laura Smith Young"
#4 ?? Could this be Alice Curtright (56y), Fay Etta's mother, wife of (#11) Benjamin Curtright? (note 1). Alice died after 1930. "Alice Curtwright, Fayetta's mother"
#5 ?? Could this be Mary Alice Smith Miller (61y), wife of (#12) George Miller? (note 2). Alice died 19 May, 1925. #8 Cornelius Vanderbilt Baker (21y) husband of (#1) Fay Etta Curtright. "For the most part the men are the husbands of the women standing in back of them." #9 Charles Lee Baker (24y) (Bette Baker's father) husband of (#2) Frances Martin. #10 Thomas Young (58y) 2nd husband of (#3) Laura Smith. Where is Eliza Smith, mother of Laura and Mary Alice, (86y)? Eliza appears in the 1920 census living with George and Alice Miller. Eliza died August 6, 1920. (1) On the marriage certificate dated 22(?) March 1919, the name of the bride really looks like Fay Etta Curtright. The witness was B.F. Curtright. Issued by the County of Multnomah. I've found a 1920 census with Benjamin F. Curtright and wife Alice - no children living with them. These people must be in this photo. Person #6 has a face which has the same general shape as #1 (Fay Etta Curtright) so that is why I think #6 is Fay's mother. Benjamin Curtright was born in MO about 1860. In the 1900 census, they were in Garfield, OK. Fay was born about 1902 in OK per the 1920 census. In that 1920 census, she is listed as wife of Cornelius. By the 1930 census, Cornelius, Fay, 4 children and Alice Curtright were living in Seattle, WA. They are indexed on ancestry.com under "L.V. Bisher". (2) I have a photo taken in 1880 of George and Alice Miller. Look on this web page. When I compare the faces of persons 5 and 11 with that photo, to me they are same people. I have a photo of George Miller taken in Oregon. It was sent to me by his granddaughter, Nita Rinehart Mede. Click here. That photo is undated but it might help us decide if George is #12 in this photo. (3) These people look like Bakers but we don't know who they are. I have my guess but I don't have any facts.In May of 2007, Ruthann Baker Bailey told me that Ivy/Iva Curtright married Roy Brown. Ruthann identifed person #15 as Roy Brown. If that is him, then I would guess that person #7 is his wife Ivy/Iva Curtright (27y). Frances Martin and Charles Baker married a few months after Fay and Cornelius Baker married. Eliza Smith died soon after the 1920 census. From the Oregon death index, she died on August 6, 1920 in Washington Co, OR, certificate #168. She is buried in Cooper Mountain Evangelical Cemetery in Aloha, OR. The death certificate does not give a birth date but gives her age as 87y, 7m. It lists her father as unknown and her mother's maiden name as Lenard. She was widowed and had lived in Aloha, OR for 22y (moved frm NC in 1898). Alice Smith Miller also died at about the same time. From the Oregon death index, she died on 19 May, 1925 in Washington Co, OR, certificate #107. She is buried in Cooper Mountain Evangelical Cemetery in Aloha, OR.. The death certificate gives her birth date as 26 Sep 1858. She was married and had lived in Aloha, OR for 34y (moved from NC in 1891). "About my Dad. I called him Daddy Charles....my Mom was Mama Frances. He would come on a Saturday, sometimes, and take me out for a meal. ( “what do you want to eat?” Porkchops.) Then he would take me to a show. ( “would you like to go to a ball game or a show?” A show. ) So we would go to the theater downtown that had vaudeville as well as a movie. We both loved the vaudeville part. One day my Dad took me to the apartment of one of the dancers whom he got to know and dated. I heard much later that she died...of pneumonia." Laura Ann (Smith Baker) Young died on 28 Dec 1930. She is buried in Cooper Mountain Evangelical Cemetery in Aloha, OR. The death certificate gives her birth date as 3 Feb 1860. She was a resident of OR for 18 years. "I do know that Laura married again , probably in Oregon, to a Thomas Young. He was "Grandpa Young" to me when I was growing up. Unfortunately, my parents, Charles and Frances, divorced when I was a baby, so I never did really get to know much about my father's family. He used to tell me, though, that I had "dozens of cousins.". I only remember seeing my grandmother, Laura, twice in my life. Once, when my Dad took me to see her when I was very little, and the second time in her coffin when I was six, and he took me to her funeral (Mark's note: Laura died in 1930). There must have been other times, but I don't remember. My Dad moved to Tacoma, where Cornelius and family lived, and I didn't see him as much." Thomas Young died on 9 Dec 1944, parents listed as Wilson Young and Latena - really Fatima - Harober. I don't think his mother's last name is right either. Buried at Cooper Mountain Evangelical Cemetery in Aloha, OR. "I was looking at Laura's death certificate today. Cornelius Baker gave the information about her on it. He said that her father's name was Smith, but he didn't know her mother's maiden name. All from N.C. though. I don't rmember a Reedville in Wash. County. I wonder if it was swallowed up by Beaverton? I also looked at my Mom's wedding certificate to Everett Abbott again....in 1929. That's the one where she lists herself as Amelia Frances Baker from San Francisco. They were married in Vancouver, WA, like a lot of people did then. But remember....their witnesses were Robert Baker and Juanita Baker. This was 10 years after she married my Dad. I've often wondered if they were ever divorced. Also, Cornelius, on his application for Social Security, lists Felix Baker as his father." To see as much of a detailed time-line from 1880 onward, look at the web page for Felix and Laura Baker. At the time of her death, she was living with the family of George Miller and daughter, Mary Alice Smith..
Felix & Laura Baker and Polly Bollinger. living with George and Alice Miller. Name listed as "Elizabeth M Miller". We have later learned that her middle name was Mahaly. deceased Husband never found (source on genealogy.com shows the name as Daniel Smith). buried in Cooper Mountain Evangelical Cemetery in Aloha, OR. By 1880, Laura Ann Smith was married to Felix Baker. By 1880, Mary Alice Smith was married to George Miller. NC deceased none source on genealogy.com shows the name as Lulu, died at 21y (1892). Lulu's father could not have been Daniel Smith if he died in 1863. This file received from Tony Bollinger on 11 Oct 2005. Records found at the York Co. Library in York, PA, list a Christian Bollinger, born 1761, who married a Margaret Runk (Runck). Church records at the library show birth dates for three of Christian and Margaret's children. They are Anna Marie born 18 December 1791, Anna Susanna born 25 May 1789, and Christian born 08 February 1784. Legion is not listed. Church records at Daniel's German Reformed Church lists church members for 1833. A Polly Bollinger and a Mary Bollinger are listed as members. There was no mention of a husband of Polly and I'm guessing that there was not one. I'm guessing that Eliza Smith was an only child, born when Polly was about 40y and not married. Eliza is always referred to as daughter in the census. Smith may have been the family name of the father (or a false name to protect the fathers reputation?). 1840: Margaret Seabaugh (1760-1848) - (her mother) head of house, one female age 5-10 (Eliza), one female age 40-50(Polly) and one female age 80-90. 1880: Felix Baker - Catawba Co., NC - Hickory /fam 466-489 Felix Baker 23 - head of house, Laura A. 20 wife, Harvey O 1 son, Eliza Smith age 47 Mother in law, Polly Bullinger 88 is listed as a boarder. 11. Christian Bollinger is also listed in the 1840 census. Christian's age shows 50-59y (if born in 1784, he would be 56y old). No female in that same age range is shown in his family. I don't know where his wife is (Catherine Killian died in 1865).